When the Northridge earthquake struck on January 17, 1994—20 years ago this week—I wasn’t physically injured. But that doesn’t mean I wasn’t hurt. Earthquakes only last a few seconds but can cause damage that will never be fully repaired. It was before dawn when the shaking started. Within seconds, my wife, my two young kids, and I were huddling under the hallway doorframe in our upstairs apartment in West Los Angeles. Furniture skidded across the floor and dishes crashed in the kitchen as we waited for the shaking to stop. There was nothing to do but hope that the ceilings and walls would hold up. They did. And we carried our 3-year-old boy and 6-month-old girl down the outside stairs, side-stepping the splattered ceramic tiles that had fallen from the apartment building’s roof. On the street, we conferred and commiserated with our neighbors, including the couple next door whose car top was crushed by our dislodged chimney. The quake’s epicenter had been 25 miles away, in the north-central San Fernando Valley, but our block had been rocked by the seismic wave, and, just a mile southeast of us, a Santa Monica Freeway bridge had collapsed at La Cienega Boulevard. At that moment, we thought that we, and everyone in our immediate area, were OK. It was reassuring that nearby buildings and utility lines were still standing. But we also could hear a hissing sound from across the street—a suspected gas leak that the L.A. Fire Department would check on later that morning. At first glance, we had escaped. Upon closer inspection, we hadn’t. When we went back upstairs a few hours later to straighten up the apartment, we discovered that the living room floor had been separated six inches from the wall. There were cracks in the walls of most of the rooms. The apartment itself appeared to be tilting. Back outside again, we noticed that one side of the building seemed to be bulging or swelling. Something was wrong. For seven years, we had been renting this second-floor apartment in a charming and affordable 1930s “Spanish-style” duplex on Sherbourne Drive in the Pico-Robertson neighborhood. But after the quake, it would no longer be home. Soon, our building and (if memory serves) three others within 100 yards became officially uninhabitable, “red tagged” by government inspectors. My family was “dislocated.” Several weeks after the quake, FEMA sent a $2,700 relocation stipend. For the first few days, we stayed with relatives. Then we managed—through a friend—to land a new rental. It was a house in nearby, upscale Beverlywood, an “off-the-grid” curvy, hilly neighborhood of single-family properties with back window views of Century City and downtown. The house was for sale and the realtor wanted people living there until the market settled. Getting our stuff to the new place was harrowing. With no time to organize, we packed and carried boxes downstairs to the truck. Two strong young guys, dispatched by the moving company, helped us pull small appliances off the shelves, clothes from the closet, bathroom supplies from the cabinets. It felt like an evacuation. All that day, aftershocks rattled the building and my nerves. 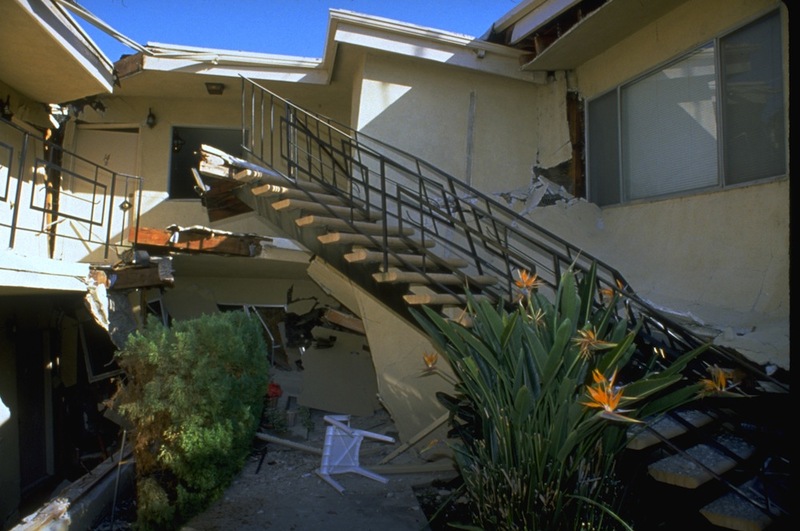 There would be more than 11,000 Northridge earthquake aftershocks in 1994, more than 400 of them palpable. Work began quickly on both residential and commercial buildings. Heroic, round-the-clock efforts repaired the Santa Monica Freeway bridge in 74 days. Infrastructure can be fixed. Human beings are more difficult to repair. Though the region was healing, my family faced uncertainty and insecurity. We were comfortable enough in the Beverlywood house but knew it was transitional. That wasn’t all. Our income was down, since all the chaos and moving had made it hard to concentrate on building our businesses (mine as a union-side labor relations consultant, hers as a clinical psychologist). And we were ringing up debt paying for—among other things—additional rent, daycare, and help at home with the kids. A couple months after the quake, the house we were renting was sold, and we were forced to move again. My wife and I argued about what to do. Could we afford to rent a house or should we scale back and settle for another apartment? This time, we spent days looking for a place before finding a single-family, three-bedroom home on a large lot in Mar Vista (west of Sawtelle, north of Venice). The second move was less frantic than the first, but still costly and exhausting. The earthquake had messed with our lives and our relationship. Not that everything—including our marriage—had been fine before. At the time, we seemed to be managing, but in retrospect, there was disruption, chaos, and stress. Despite couples counseling and other remediation, we never quite recovered. Could our marriage have lasted if not for the conflicts triggered by the quake? There is no way to know. The earthquake exposed cracks and fissures in us. We separated less than two years later. Memory is selective, particularly when reconstructing a narrative or ranking the pivotal events of one’s life. No matter how I cut it, the Northridge earthquake always ends up near the top of my list. Lou Siegel, a Los Angeles-based union activist, consultant and educator, teaches Labor Studies at LA Trade Tech College and blogs at laborlou.com. The Los Angeles "Who We Were" series was made possible with support from Cal Humanities, a non-profit partner of the National Endowment for the Humanities. Visit www.calhum.org. Primary Editor: Joe Mathews. Secondary Editor: Becca MacLaren.